I love Hillsdale for its commitment to an old and venerable mission of improving the hearts and minds of students. I am grateful for my Hillsdale friends who are willing and able to converse about moral philosophy, obscure alternative rock bands, and every topic in between, as well as for Hillsdale professors who trust their students, correct them kindly, and encourage them both as scholars and as decent people. At Hillsdale, I found myself surrounded by people I wanted to emulate, discerning them to be equal parts trustworthy, kind, hilarious, and serious, and altogether hungry for truth. Matt was born and raised in East Lansing, MI. At Hillsdale, he majored in history and minored in Latin, and was a member of the Honors Program, Phi Mu Alpha Sinfonia Music Fraternity, the Tower Players, the Chamber Choir, Omicron Delta Kappa Leadership Honorary, and the History, Classics, and Theatre Honoraries. 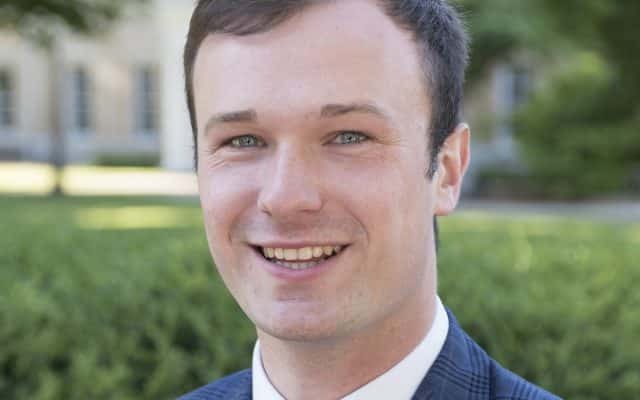 Some of his favorite Hillsdale memories include weekend dinners with upperclassmen, statue golf with his Simpson hall mates, and traveling to Turkey and studying at Oxford with his fellow Hillsdalians. He enjoys witty humor, acting, singing, watching other people act and sing, and traveling.